I have always been impressed by the quality of guests that Sesame Street persuades to be on their television programs. Johnny Cash, Paul Simon, Stevie Wonder, Beyoncé, Alicia Keys and Feist are but a tiny sampling of the names that have appeared on the program. 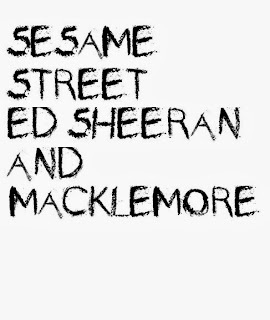 Very recently Billboard released a video featuring bits of the upcoming Sesame Street spots with Ed Sheeran and Macklemore. Seeing today's pop culture shared in the Sesame Street format is a lot of fun and I love the talent that Sesame Street uses to parody many popular songs in a child-friendly manner. However, did you know that Sesame Street does not actually have to persuade celebrities to appear on their programming? That in fact, many celebrities often come knocking at Sesame Street's door ASKING to appear on the program? That really says something about Sesame Street, don't you think? 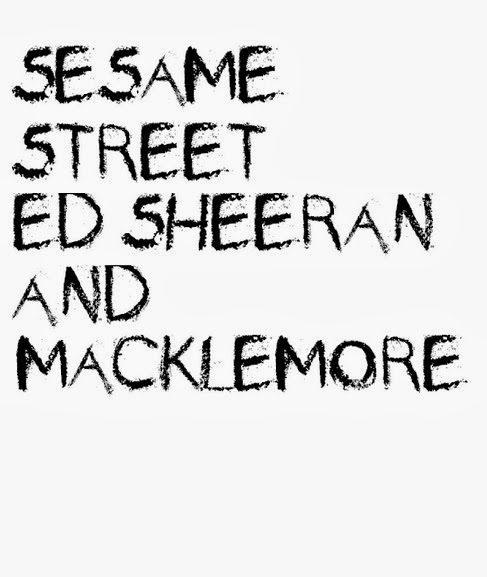 I'm so glad Sesame Street embraces those requests! Here's the sneak preview of the Ed Sheeran and Macklemore spots. However, if you are interested in watching the actual segments, you will have to tune into Sesame Street for the September 2014 season when they are scheduled to appear.